Hello, and welcome to my second article here on Eternal Central. My last article was about my success at GP Paris with my beloved Miracles deck. It is arguably the best deck in the metagame as of now, but somehow it’s still lacking popularity, especially in the US. But why is this? Miracles is a difficult deck to play (especially playing quickly enough for tournament constraints), even though it might not look like this all the time. In the following articles I will talk about certain philosophies of this deck, as well as certain approaches on the most important matchups. But enough of useless babble, let’s get it going. This is one of the most simple, yet most important pillars of playing this deck. It may seem inconsequential for a deck that is as reactive as this one, yet it is often one of the most often ignored points. Basically speaking: Miracles has to play the control role in pretty much every matchup. Corner cases like Eldrazi-ramp notwithstanding. So what does being patient mean exactly? And why is it so hard to play correctly and patiently at once? This comes down to one very basic, yet often misunderstood, principle. It’s the principle of choice. This one is going to be a little deep, so get ready. What is choice in magic? Well according to an article by Chinsung Chan, choice comes down to what card type you are dealing with. Creatures (without flash) have the least choice integrated, as you can only play them in your main phase. So in each of your main phases you make your decision whether you want to play the creature or not. Once deployed, the options of choice aren’t that high either – attack, block, special ability, or whatever else the creature might do. But compare this to an instant or creature with flash. At literally every point in the game you have the option to cast this card, should you wish to do so. Even deciding not to cast a spell is a decision. So decks with a high amount of instants have a higher level of decision and therefore need more skill, but also reward said choices better. That’s why many good players will always play blue decks, that coincidentally have a lot of instants and/or abilities to interact with your opponent. But what does this have to do with Miracles and patience? Well, when looking at Miracles you see that besides lands pretty much every card is either an instant, or meant to be played/activated like on, with the exception of Counterbalance and Jace, the Mind Sculptor. The conclusion is easy: adeck built like this offers the pilot a wide variety of options, which gives the player many opportunities to screw it up. It obviously has something to do with skill and familiarity with the archetype, but additionally there are a few guidelines people can use to improve the outcome of any game by vast percentage. What does this mean? And why is it so hard for players new to the art of control to understand? Brainstorm is certainly a powerful card, and can be played as soon as turn one. Oh god, how I detest those T1 Brainstorms. For a general rule of thumb: Brainstorming on turn 1 is always wrong in a control deck. Brainstorm should generally be cast when you are under pressure to do so, for example when you cannot hope to win the game without doing so. Being short of land drops, or lacking a very substantial answer is reason enough to Brainstorm. Other than that there is no reason to Brainstorm, ever! Optimally you end the game with multiple Brainstorms in your hand, sitting there and telling you how masterfully you played that game. Even though this doesn’t happen all too often, because many matchups are really hard, it should still be your goal to never cast it until you have to. If you have the choice between casting your Brainstorm now or on one turn, be patient and wait. Not only does Brainstorm’s value rise with each passing turn, but you also have the possibility to draw the card naturally that you were looking for. And if not you may still cast a powerful Brainstorm, best accompanied with a fetchland. Exceptions to this rule are Miracle spell cluttered hands. Once again you can see the tendency to hold back your spells as long as possible, optimally until the victory itself. Principles like this go for many cards in the deck, probably for most. Act when you are forced to, not before. Don’t waste powerful cards because you could cast them. Cast them, when you are forced to do so. Playing according to this rule will surely improve one’s ability to play Control in Legacy. Yes, you read correctly. I will now tell you how to stack your deck. Legally, of course. Even though it is common knowledge that Sensei’s Divining Top is Miracles’ core card, allow me to drop another passage or two on this topic. 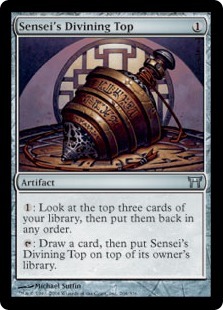 Sensei’s Divining Top doesn’t just synergize well with Counterbalance, it also enables us to float Miracles on top and cast them, whenever we should wish to do so. 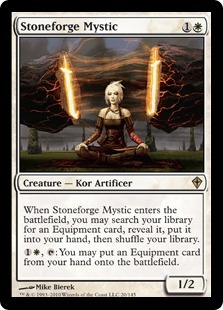 What really sets apart good from bad Miracles players is the frequent use of this card. 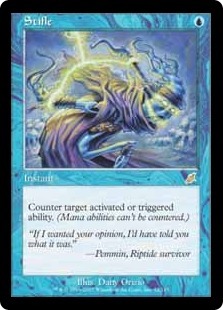 Over the course of a match you will use this card unbelievably often. This effect is pretty close to an extra cantrip each turn, and we all agree that cantrips are probably the most complicated spells to play. Now imagine casting at least one cantrip every turn – this leverages the mental skill needed to play this correctly to a mindblowing level. It’s pretty hard to compare this to a way more linear deck like Team America and still claim that those decks are equally complicated to play. Additionally – as Sensei’s Divning Top’s activation is instantly usable it adds another layer of complexity on all of this – similar to what I explained above. A long time ago a friend told me, that you should always know what you are looking for, when putting a cantrip on the stack. As the activations of Sensei’s Divining Top are cantrips you should know what you are looking for, plus you should have a priority-list on what you’d like to see. Doing this every single time before resolving a Ponder, Brainstorm, or activating your Top will help you speed up your game drastically, which is another important factor you have to think about when playing Miracles. Playing Miracles well doesn’t mean chaining the cantrips correctly and being patient, at least not by itself. You also need to deliver the best you can in a certain timeframe, which is a big problem for many players. One rule of thumb: If you have problems finishing three games with a deck including Stoneforge Mystic or Delver of Secrets, you should probably play another deck than Miracles. But more on this later. Another very important factor of stacking your deck correctly with help of your Tops are fetchlands. Playing as many fetchlands as possible will vastly increase the quality of your cantrips in the mid and late game. Playing fetchlands correctly is yet another story. General rule of thumb: try to keep fetchlands for the latr game, as shuffle effects will start to be more valuable, as soon as you hit a point in the game, where you are under no immediate pressure and start stacking your deck, accordingly to your plans. Once again, the basic principle of patience intervenes, what a coincidence! Being able to stack the top 3 cards of your deck correctly is the most important feature when playing Miracles. When you lose you may not see your faults immediately, but probably you screwed up some Top activation in the process of the game. Doing his in timely manner is one of the most important things you can do. Don’t activate Top when you don’t have to. Besides bluffing there is no reason to look into the Top in response to some spell you wouldn’t even counter if you found the Counterspell or whatever. Don’t waste time here, as said, unless you plan to bluff. Do know when you want to activate your Top on your upkeep. Plan ahead, and think whether or not you need the mana this turn – if you don’t – then take a look and improve the quality of your draws. Miracles will hardly overwhelm the opponents with raw card advantage, but no deck in this format has card quality like we do – cantripping once each turn sets us very far apart. Be aware of the very simple fact that hiding your best spells on top of your library should be what you’re doing – unless you plan to fetch in the near future. Plan accordingly. As mentioned above Miracles players have to face two opponents at once. One of them is sitting across from you and will try to beat you with his cards, which should be hard enough for him. Many good players will have no problem crushing the opponent with Miracles, but will still give in to the second opponent. This one is hanging somewhere in the tournament hall. It’s the time. Playing Miracles well is not all about playing perfectly, it’s about making the best possible plays in the shortest amount of times. Take me for example. I am very well aware of the fact, that I do not make the best plays. But I think I am one of the best, when it comes to making the best plays possible in the shortest time possible. If you want to see me play at lightning speed, go back to my first article and take a look at the videos embedded from the Grand Prix. Sometimes I pause, when there is an extremely tough decision, but generally I’d play as fast as I can. And this is most definitely my key to success. Admitting, that there was a better play, but also forcing anybody to admit, that the ratio between the quality of the play and time invested in it is pretty high. So how do you play so fast? First of all, you have to be kind of a faster player. If you are on those people who keeps his hand and then thinks for a minute, you can skip this point – it’ll be very hard for you. For the rest of you: besides practice there are a few tricks you can do in order to improve your speed when playing Miracles. 1) Know what you are cantripping for. Be aware of what you want, what you would keep and what you want to shuffle away before you cast/activate your cantrip. Following this method will enable you to judge the cantrips in question way faster. 2) Know your opponents deck. Know what they can have, and especially: When they could cast it. Skip the parts of your turn where their deck won’t be likely to interact. If your turn consists of drawing a card and immediately passing the turn, you might be on the right path. 3) Know when you are dead. Don’t fight till the bitter end when the chances of you winning are too small! This will safe you important time. 4) Ask your opponents to play faster, if they feel like going into the tank for far too long or too often. Call a judge if they don’t stop doing so. 5) Know every card in your deck, you may never be surprised that the card you drew just won you the game, but you didn’t know it would. This interacts closely with the “cantripping rule”. This does not mean you should rush through every game at lightning speed. It means you have to find your personal equation for success. I could be playing even faster, should I wish to – but I wouldn’t be able to keep up with the quality of my plays. So the speed I operate on is what I call a personal speed cap. Everybody has to find his own cap, that’s the point where he/she finds comfortable enough playing at a given speed, while executing reasonably good plays. Working on this equation is tough and requires a lot of experience, but is definitely worth it. When your personal speed cap is very slow you should play more real life Magic and Miracles as a whole – or you should consider switching decks. Keeping this cap as high as possible is an important factor when it comes down to being successful at a big tournament, as draws are as bad as losses, at least an early one. 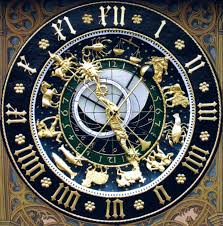 Additionally – be aware of the time and how to use it for you. If you won the first game after a long struggle and you see the possibility to stall in game (this does not mean playing slow – this means avoiding to lose – in game) – do so. But only if you are sure you can do so. The best example was my BUG opponent at the GP, where I won G1 – and G2 he dropped a Winter Orb. I then decided to not rush my win option, but rather play it safe and play removal only, as my rushed win-con could have been double-countered. So I stalled in game, while still playing at my maximum speed – ending the game at 1-0. Be aware of this option at all times. So, after diving into some aspects of the philosophy behind playing Miracles I’ll come to something many people have asked me for. Sideboarding with my most recent list from Grand Prix Paris. Here is a kind of comprehensive guide as how to approach the most popular decks. I’ll focus on the most popular ones, but go in depth there. BUG Delver (aka Team America) was the most played deck at GP Paris on Day Two, which is saying something. With a combination of countermagic, discard spells, and a quick clock it has a terrific matchup against most Combo decks. Additionally it has a very solid game plan against opposing Tempo-strategies, plus the color combination and deck construction enable the pilot to play powerful hate against True-Name Nemesis, without being hit by it, in any meaningful way. Paired with a very straightforward game plan this deck is a real contender for the top of the format as of now. So how does Miracles fare against this type of deck? Well, let’s break it down. Modern Team America lists don’t play anything that could evade Swords to Plowshares. All the targets are easily killable, as there is no Nimble Mongoose, and no True-Name Nemesis either (or rarely, at least). Some of the newer lists play Dark Confidant in addition to the old combination of Delver of Secrets, Deathrite Shaman, Tarmogoyf, and Tombstalker. Dark Confidant is different from the other creatures, the former four are just bad creatures, in the sense of us approaching the matchup. They don’t do anything but attack and can be killed by any removal. Dark Confidant on the other hand is different. He forces us to react, forces us to act rapidly, forces us to break up with patience plan – which is bad. Previous to Dark Confidant I was pretty confident calling this matchup easy. Dark Confidant drags it towards a balanced matchup for sure. The flexible slots in which Dark Confidant sits in could also be used with Liliana of the Veil, another card that isn’t too easy to deal with. Despite the fact that Lilly will never win a game on her own she is a pretty potent auxiliary card, when it comes to the stage of the game where Miracles can’t just kill everything with ease. Thankfully enough it’s either Dark Confidant or Liliana of the Veil, not both – as those are the only cards in the main deck of the opponent that we really care about. Instead of RUG Delver’s Stifles, Team America plays discard, which is way easier to play against than the almighty Stifle. Another plus point. So, preboard our deck is overly well equipped to deal with all of their threats, only their flexible slots can hurt, quite a lot. Be it Dark Confidant, Liliana of the Veil, or Sylvan Library – all are either hard to deal with or can’t be left unchecked. The less they play of those the easier the matchup is – yet even with them I’d never say it’s worse than 50-50 – which is why we have to fear the postboard matches – where it’s getting tougher, for sure. Okay, this looks weird, but let me explain the plan. The opponent plans on us having many Enchantments, which they can deal with. When we don’t bring any in it leaves the opponent with dead cards – that’s why Vendilion Clique gets cut too (Golgari Charm splash damage). As soon as the opponent has dead cards we have to counteract their supremacy in stack interaction with boarding Flusterstorm and Counterspell. Additionally I bring Disenchant to antagonize their silver bullets such as Pithing Needle, Sylvan Library, Null Rod, or Winter Orb. With this plan you are generally next-leveling your opponent, leaving them with more dead cards again postboard, disabling their ability to have a positive matchup even post-board, leaving this matchup at a comfortable slightly positive tendency. When talking about Esper you have to take into consideration that there are essentially two different decks. Esper Control and DeathBlade. While you have to treat one as a Control deck you have to deal with the second just as it was a Creature deck. Let’s start with Esper Control. Esper uses all angles: creatures, planeswalkers, countermagic, and discard – making it a tough fight. Preboard they have quite a few dead cards, while all of ours are live. Our main plan should be to make sure Jace, the Mind Sculptor doesn’t hit the board, while we should try to not die to Batterskull. Swords to Plowshares are not needed, as we have Terminus and Red Elemental Blasts, alongside Explosives to deal with the opposing creatures. Depending on what the opponent brings in for this matchup it can fall somewhere between slightly negative to slightly positive, leaving us with a pretty even, yet not unwinnable matchup. When facing the heavier creature-based version you want to keep your Swords to Plowshares, cutting your Spell Pierces and Counterbalances. Spell Pierce isn’t at its best here, nor is Counterbalance – as the opposing threats range from different casting costs to different card-types – mainly creatures. All you want to do here is kill everything, which shouldn’t be too hard with you overload on removal. Once again – don’t forget to play around Jace, the Mind Sculptor at any time given – based on the patience principle – rather get hit once more than lose to a Jace! UWR Delver was Legacy’s new boogeyman prior to GP Paris. This threat-light tempo variant is a very good matchup for Miracles. There are no overly complicated things to take care of – kill everything that hits the battlefield in the correct order. Make sure to always play the worst possible removal, keeping the most versatile till the end. UWR can’t really bring anything flashy or fancy to the table, as said above it’s an easy match-up which you shouldn’t care about too much. RUG Delver (aka Canadian Threshold) is the toughest of the Delver decks to face, and one of the reasons Rest in Peace is still in my sideboard, despite me not bringing in against BUG Delver. Nimble Mongoose is hard to deal with, and they play the best possible disruption spell in Stifle. Constraining our mana should they wish to, or simply Stifling Miracle triggers is huge. This matchup is a huge skill tester, and, once again, the more patient the Miracles player is (or can afford to be), the better the matchup gets. 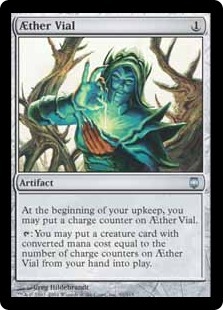 Your main win condition and best disruption spell is Counterbalance, so protect it by all means. Be patient with it, make sure that when you cast it, that you can protect it, as if you manage to do so you’ve pretty much won the game. Against this deck it’s probably more important than ever to be patient, as acting early will cost you games. These two are the premier Combo decks of our format. Being able to beat those two cornerstones has always been important, and a reason for why it’s so hard for non-blue decks to prevail in Legacy. When talking about Storm I will talk about Ad Nauseam Tendrils here, as it is the way more popular variant. If I start taking decks that are on the fringes my match-up section would triple its length. So I’ll focus on ANT only. One of the biggest strengths of Storm is threatening a kill as soon as turn 1 – even though it takes much longer sometimes. But you don’t know how fast the opponent will be – and that’s why it’s important – once again – to be patient with your actions. When playing against TES you have to be prepared for them going off every turn – against ANT not so much – or at least that’s what people will tell you. Even though ANT is labeled as being slower, you have to keep in mind that this does not mean slow. It’s still a combo deck that threatens to Tendrils you to death at any time given. Keep that in mind. Pre-board our one and only game plan should be to protect our Counterbalance (with Brainstorms and Counters), as this card with lead to the inevitable win. Play accordingly – and don’t be afraid of casting Snapcaster Mage as soon as turn 2 – as you’ll be losing the late game without Counterbalance. I board out the Plains because this card is just plain (pun intended) useless – plus we don’t need that many lands anyways against decks where there is no risk of our manabase being disrupted. Three Swords to Plowshares stay in to deal with Xantid Swarms or Dark Confidants, and the rest should be fairly obvious. The second combo deck is the best variation of Show and Tell – Sneak and Show. The game plan here is very simple. Counter their Show and Tells and Sneak Attacks. Having the game reduced to such stupidity annoys the hell out of me – but it’s okay – I can’t change anything. The plan is as simple as their deck – gather as many counters as you can and counter everything they play. Pre-board this is tough because we have so many dead cards, but this should be mitigated with our onslaught of additional help from the sideboard. The start should be rather obvious, though Disenchant and Engineered Explosives might not be too apparent for everyone. Post-board we have the counterspell-supremacy, and it’s their turn to play pesky permanents that ruin our day, such as Pithing Needle and/or Defense Grid. You don’t want to remain exposed to these permanents, without any answer. Having three in your deck makes sure you don’t just outright fold to this cards. Just as there are only two things that are certain in life, is is certain that you will have to deal with this deck, eventually. This mono-white aggro-control deck is quite a challenging matchup to play against, but once you know what role you are to be taking, it becomes much easier. This matchup stands and falls with the presence of Aether Vial. If they don’t have any, it’s rather easy, if they do – it’s hell on our strategy. Our deck is supposed to be reigning over the stack, but if all of those creatures have flash and are uncounterable it’ll be tough. Your main plan should be stalling, as long as you can – and then finishing them off with Entreat the Angels, most of the time in your own upkeep in response to the opposing Rishadan Port activation. Even though Counterbalance is rather good I prefer to board it out and play a different game than they expect us to – at least partly. Your plan against Death and Taxes is twofold. First of all you should focus on beating Aether Vial – that’s the first priority. Once this is done everything else will be easy, trust me. If you can’t do this, you’re probably boned. Regardless of the outcome of plan 1 – you have to play the Jace game, protecting it with your Force of Wills and Counterspells. Despite the fact that Jace is often deemed a bad card in this matchup it should be your standard route to victory. 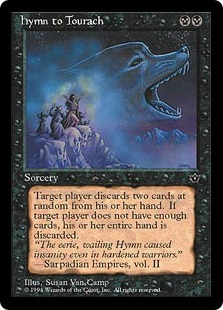 Keeping in so much countermagic will often catch the opponent off guard, making their Cataclysms look pretty bad. Oh, and there are still Entreat the Angels in the deck, which will win you the game on the spot. This article dipped into the strategic aspect of Miracles, but just scratching the surface, as there are endless subjects at hand to discuss, especially for such a nonlinear Control deck as Miracles, with an ever-changing metagame. I hope you liked this strategic excursion – let me know if you did, or if you did not. Should I continue to write about dry but useful stuff like this, or would you guys prefer to read something more enjoyable like the history of Miracles? Let me know in the comments below!